Do not, I repeat, DO NOT judge a book by its cover. The fresh-faced young musicians who comprise the Nashville band known as The Vespers play and sing way beyond their years. There is, however, an experienced professional element present here, as lead singers (and sisters) Callie and Phoebe Cryar (21 and 19 respectively), cut their musical teeth singing background vocals on Music Row. The Cryar sisters’ vocals are as hair-raisingly sibling-close as the Louvin Brothers, the Avett Brothers, and the Secret Sisters (Laura and Lydia Rogers), but it wasn’t until they met brothers Bruno and Taylor Jones at a campfire jam that The Vespers became fully formed. The Vespers make no attempt to hide their Christian faith, but it is certainly not an in-your-face attitude. The opener, “Better Now,” is a modern take on the New Testament parable of the blind man made to see by Jesus, a miracle no one believes. A stronger metaphor for faith there never was. “Flower Flower” is pure pop nectar with a very grown-up message. The song is an absolute delight. The Vespers – Flower Flower – Official Music Video [HD] from The Vespers on Vimeo. “Got No Friends” is an infectious and wholly original song about the path to salvation. In the hands of The Vespers, the path flows from the mailbox to the sidewalk to the arms of Jesus himself. It is a gorgeous tribute to faith and God (and faith in God). Jesus is well represented on this album. There is also a valiant attempt at a Son House cover, “Grinnin’ In Your Face” that puts a new face on the old blues classic. The miracle of The Vespers is their ability to meld youthful energy with a spiritual background that can be traced to gospel tunes of The Carter Family. 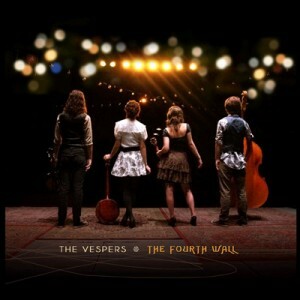 In fact, they have as much in common with that famous family as they do with the Louvin Brothers, as well as contemporaries like the Avett Brothers and Mumford & Sons — the Vespers are just that good. The only dud on the album is the importunate “Footprints In The Snow,” a number that, at its genesis, begins as a pulsating and insistent instrumental, but steadily descends into pop music territory with a repetitiveness that eventually becomes tiresome. An absolute gem, however, is Callie Cryar’s “Winter,” an emotionally wrought portrait of obsessive love and a heartbreakingly beautifully ode that tells the tale of a passenger on a train who is haunted by a lost lover’s icy grip which she is desperate to escape. On the whole, The Fourth Wall features the glistening vocals and expert instrumentals of a very mature band. The sound is clear and precise without sounding too highly produced. I highly recommend you check out The Fourth Wall. If you’re up for a live show, the band is currently on an extensive North American tour.